Transmutation/Incineration can be performed in critical reactor systems and subcritical accelerator driven systems (ADS). 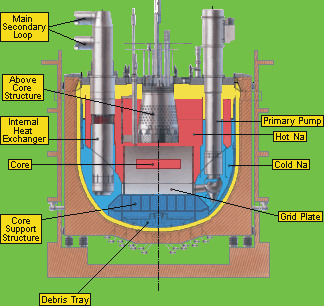 Examples of a critical waste burner reactor (CAPRA/CADRA reactor) and an ADS are given below. Besides reactors with traditional solid fuel, systems with liquid fuel (Molten Salt Reactor) are also under investigation. In these advanced systems the minor actinides are not reprocessed into solid fuel pins but dissolved into salt and transmuted resp. incinerated. 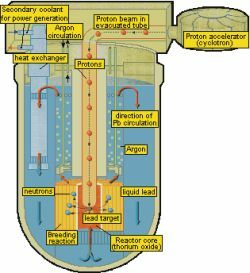 The massive loading of Pu and MAs into a reactor core or the utilization of fuel, purely made of Pu and MAs (dedicated fuel) might lead to a deterioration of safety parameters of the reactor system. Because of safety reasons therefore a limit for the loaded quantity of MAs exists for fast critical systems. The MAs can either be homogeneously mixed with the fuel or can be placed separately into targets (MAs embedded in inert materials) for incineration. Both variants however limit the additional MA mass in the core and therefore increase the number of burner reactors in a reactor park. For ADS the salient hope exists that due to its subcriticality the deterioration of safety parameters can be coped with and a higher MA load can be deposited in the core surrounding the external neutron source. The number of ADS dedicated to destruct MAs will therefore be only a few within the reactor park. Possible realizations of transmutation and incineration of Pu and MAs within a reactor park are displayed below. In the left single stratum concept the nuclear waste is transmuted / incinerated in a park e.g. with critical reactors. in the right double strata concept the problematic elements Am and Cm are treated in an ADS waste burner. Details can be found in a EURATOM report: EUR 19128 EN (2000): Evaluation of Possible Partitioning and Transmutation Strategies and of Means for Implementing Them.